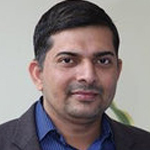 Dr. Aviral Kumar Tiwari is an Associate Professor of Economics at Montpellier Business School, Montpellier, France. He received his Ph.D. in Management (Economics) from ICFAI University Tripura, Tripura, India. His research areas are energy and environmental economics, macroeconomics, international finance, fiscal policy and tourism economics. He has published several papers (i.e., more than 100 papers) in international journal of repute such as Annals of Tourism Research, Energy Economics, Economic Modelling, Applied Economics, Economics Letters etc.